As each of my kids approached mid-fall of their second grade year, an excitement comes over me in anticipation of the Saint project! My oldest son had a thing for St. Francis. He loved animals and thought that Francis was the man for him. We read up on the saint’s life, found a hooded brown robe, tied a rope around his waist and then adding a stuffed wolf, we were all set. My second son decided St. George was who he wanted to portray. We had some plastic “armor” for him to wear, along with a foam sword, and again, a stuffed animal, a dragon this time, completed the ensemble. Just this week, my youngest decided to emulate St. Teresa of Avila. This pleased me greatly, since I have an affinity for St. Teresa. She cited that her favoritism was due to the saint’s ability to experience visions and in one image, she wears a “cool black crown.” So three yards of brown, tan, and black fabric later, she has a costume that St. Teresa herself would be proud to wear. Why do we do this? Our Catholic Schools and Religious Education programs promote our small children to dress up as saints once a year and it is exciting. The kids process into Mass or a perhaps a program to the tune of “When the Saints Go Marching In”. There is an excitement felt by all the children and the adults alike. It is a rite of passage of sorts and for a lot of us, it has become tradition. The kids do research on their saint and are proud to show off what they have learned. I remember myself– as my grandmother and mother fashioned a habit for me to wear– holding fake roses and a crucifix in the style of St. Therese of Lisieux. I was excited and a bit in awe of what I had become even if it was just one single morning. 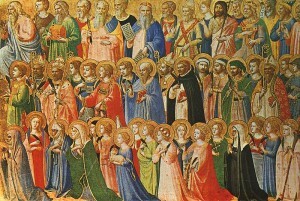 The saints are the rock stars of the Catholic world. They are what we should emulate as human beings. They have accomplished what we all strive to achieve, and that is heaven. We know all about them: the way they died– think St. Jean de Brebeuf, the way they lived– think Mother Theresa, what they wrote– St. John of the Cross, how they persevered– St. Monica, and their relationships with the Lord. These are just a few examples of amazing people who were amazing souls. We talk to them, ask them the favor of putting in a good word for us to the Big Guy, and they never let us down. The important thing is that they were mostly just human beings who had so much faith, they changed themselves– which we all know is hard to do– and they changed the world– something we quite often give up on ourselves. We have to introduce our children to their role models early enough that they will attempt to be like them and grow their own faith. These characters can be flawed (St. Paul and St. Augustine), they can be pretty and feminine (St. Rose of Lima), they can be masculine (St. Michael and St. Ignatius), they can be loners (St. Calistus), they can be just like us! What they all have in common is faith and trust in Almighty God. They prayed with fervor and had faith enough to move mountains. Just as we hope for our kids to discover the saints, we can’t forget to “dress up” either. We can wear the smile of the joyous saints, we can suffer with grace like the martyrs, and we can wear the armor of faith that protects us from the enemy. As adults, we can get ready for All Saints’ Day and choose a role model, just like our kids do, and we can profess to ”be” that saint for the year. 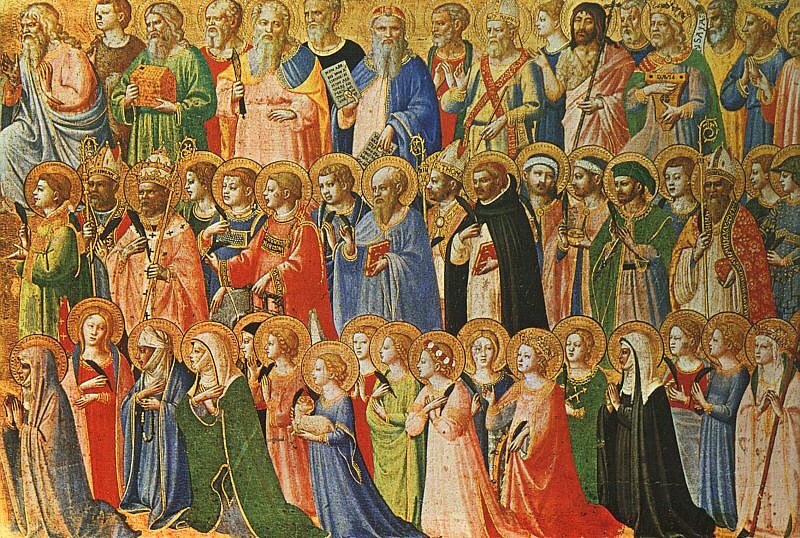 Who will you be when the saints go marching in?